An implant overdenture combines the use of traditional dentures and implant technology to create a denture that fits over your remaining natural tooth roots or dental implants. These root or implant supported dentures are held in place by dental attachments which provide excellent stability and support for your dentures. 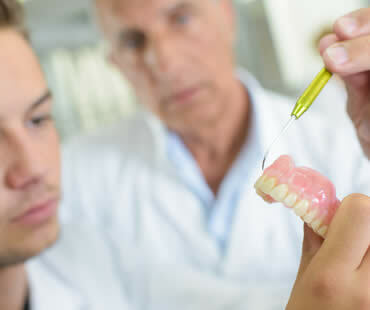 Overdentures were developed to help patients missing some or all of their teeth regain a quality of life that may have been lacking since they lost their teeth. Saving your natural roots or having implants placed slows bone loss by stimulating the bone in your jaw when you eat or chew. Because overdentures are better fitting by design, they are more stable and allow you to chew food more thoroughly. This promotes better digestion and allows you to absorb more nutrients. The increased stability provided by overdentures also means you are able to speak more clearly, as there is no slipping or clicking of your dentures. Loose dentures are not a worry with overdentures. Sticky adhesives and messy denture creams are unnecessary when you have implant overdentures. With overdentures, the natural shrinkage that occurs from an under-stimulated jaw does not occur. This keeps your face from looking sunken, as can often happen with traditional dentures. To find out if you are a candidate for implant overdentures, schedule an evaluation by your dental professional. Overdentures could be the best, most natural treatment for restoring your oral health and beautiful smile.